TECHknitting: QUICKtip: the best first stitch or: "how to avoid the slip knot"
QUICKtip: the best first stitch or: "how to avoid the slip knot"
If you make a simple loop, there's no knot, and a knot (even the slipknot recommended by most instructors as the first stitch of your cast-on) leaves a nasty little nub in your work--best avoided. To start your cast on with a simple loop, just insert your needles and twist, and there's the first stitch, waiting on your needles. If the loop unwinds when you make the second stitch, that only means that you made the loop with the wrong end up. Twist it the other way and try again. 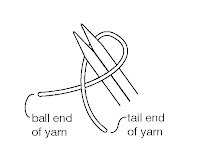 BTW: The illustration shows two needles because for many kinds of casting-on (long tail, in particular), it IS best to cast on over two needles.